Just in time for Father's Day! A fun DIY project. You can ignore the religious context of my project if you like and imagine a canvas full of all kinds of words to inspire! Family, friendship, happiness, peace...whatever you like! This would certainly be a fun project for Father or Mother's Day. Purchase a canvas at any craft or art store along with your choice letter stickers. This is a GREAT way to use up some old mismatched stickers if you have them. (Vinyl type stickers over papery stickers work best as I'll explain later.) 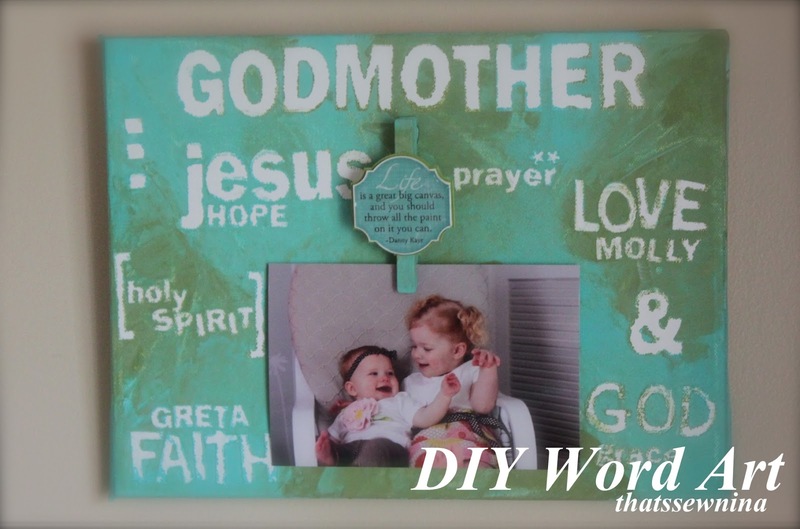 I decided to turn mine into a easy-replace picture frame with the use of a clothespin but you could certainly skip that and just do words or embellish in other ways like fabric flowers or a mirror. Place your letter stickers all over the canvas in whatever arrangement you like. Feel free to use shapes in addition to words. (Flowers, circles, etc. I used some of the extra punctuation stickers since alphabets were all I had.) Remember that we are just using the outline of these stickers so the color of the stickers really don't matter. Swipe a credit or something with a hard edge across the stickers to make sure they are securely on the canvas. Squeeze some small blobs of paint around the canvas. A little goes a long way so don't go too crazy to start. This is the part I was hoping the girls could participate in. Curly Girl got one finger in the paint and ran for her life. I tried to get GiGi to place a neat hand print under the space for the picture and she got paint EVERYWHERE! Using your edge, swipe the paint around in different sections of the canvas in all different directions. Blend it together and play around with it until you get something you like. Keep adding blobs of paint as you go to get the color where you want it. Don't forget to paint the edges of your canvas. Here's my painted canvas! Let the paint dry thoroughly. Using a knife, beginning picking at the edges of your stickers to lift them off of the canvas. Tip, I seemed to have the most luck when I peeled up at least a full edge of the letter before trying to peel the sticker off. Some of my stickers were a more vinyl material and others were a more absorbent paper sticker. If you have the choice, the vinyl stickers peeled much more easily. You're going to find that the paint does bleed into the edge of your letters. I like the raw look of this but if you don't, I was able to scrape off a lot of it just using the edge of my knife. I'm sure there are some painting tricks to avoid this (like try painting your whole canvas white and letting it dry before placing other colors over your stickers). To finish it off, I painted a clothespin to match and hot glued it in the center of the canvas. I found a quote sticker I really liked so I also stuck that on my clothespin. Now Godmother can easily switch out pictures as the kiddos grow. You guys are so sweet! Thank you. It turned out pretty well. I hope Jen likes the final result. Suz, you know how she does love a craft project on canvas!